Raw milk goes to court Monday in B.C. 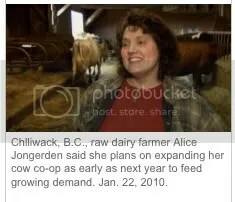 "Go ask Alice..." That's Alice Jongerden, the woman at the eye of the hurricane around raw milk in B.C. CTV B.C. photo and caption. 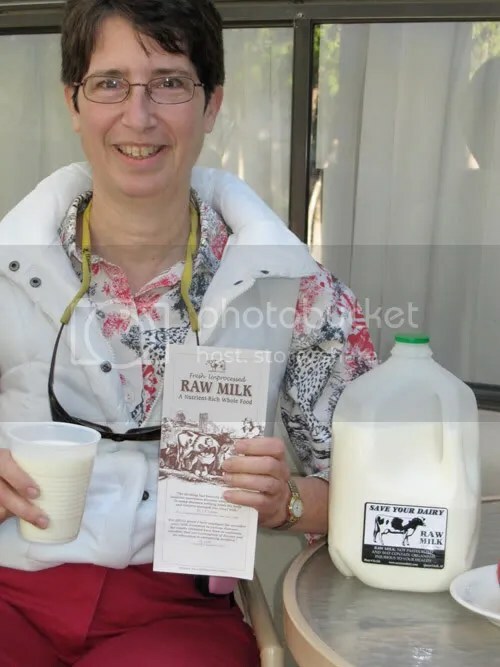 Two weeks ago Fraser Health Authority served Notice on our Agister that it will apply for an injunction to stop her from “packaging and/or distributing” raw milk produced by our herd of cows. Covert action against citizens groups? 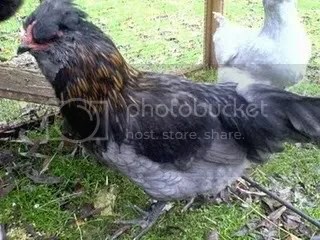 A game of "chicken"? Steps Towards Self Sufficiency blog photo. “An increasingly common tactic of governments and establishment pundits in the U.S., Canada, and other countries these days is to refer to the opposition to their policies as being motivated by “conspiracy theories” of one kind or another. 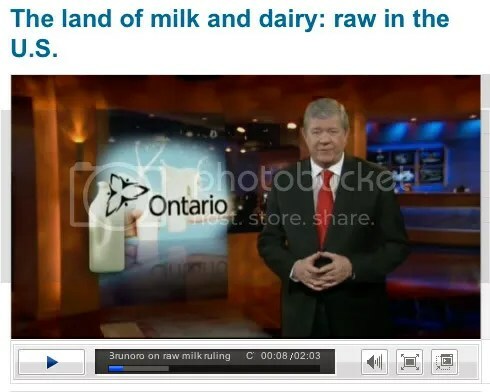 Video below — shades of the raw milk battle — is that “Ni” or “Nay”? Although the court decision is seen by some as a victory for human rights, it is in my view a retrogressive step potentially taking us back to a pre Louis Pasteur era when milk products were responsible for many deaths and illnesses due to contamination by a variety of deadly pathogens: Salmonella, Listeria, E. coli, Streptococcus, Staphylococcus, Tuberculosis and Brucellosis. 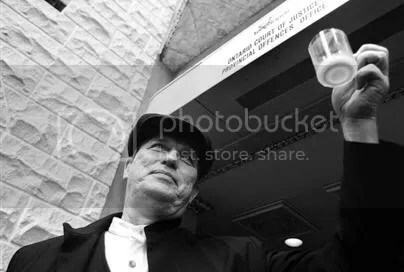 National Post photo of Michael Schmidt toasting to victory outside the court. “I admit, the skeptic deep down got the better of me. Luckily, I was proven wrong, and my faith in justice has rung true once again. Tagged as Canada, Canadian Constitution Foundation, health, Karen Selick, legal, Michael Schmidt, politics, raw milk, rights, U.S. Raw milk in the U.S.A. — CTV B.C. “When it comes to unpasteurized milk in Canada, law makers err on the side of safety, prohibiting people from selling raw dairy products and challenging the legality of a dairy co-op as a way for share-holders to get raw milk. “Miller addressed other subjects at St. Mary’s during his talk to a Grade 10 civics class. He said he predicted the acquittal last week of Michael Schmidt, the Durham-area dairy farmer and champion of drinking raw milk. Charges related to allegations he illegally sold unpasteurized milk. “It goes back to my beliefs in smaller government. Where do you draw the line on how much the government gets involved in our (lives)?” Miller said.